SMS autoresponders are simple text message interactions between you and your clients. People are invited to send a text message with a keyword you choose to a short code (for example: 82257). Once they text in the keyword, they will receive an autoresponder with a welcome message, call to action or alert about your brand, service or any communication you’d like to have with your current and potential clients. 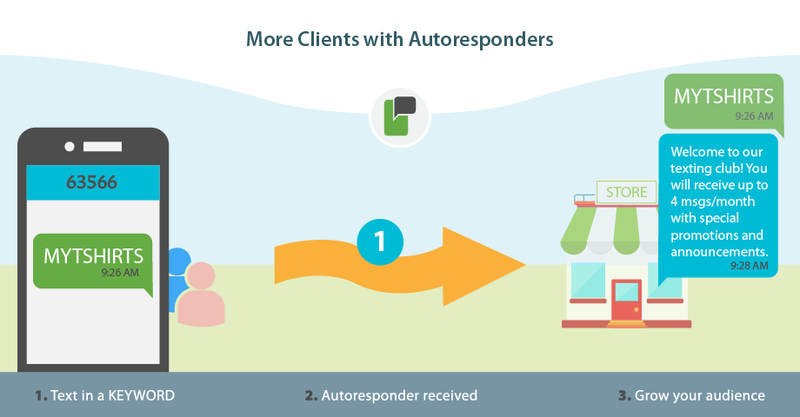 By utilizing autoresponders in your SMS marketing campaigns, you will be able to build a database of subscribers, and later target them with promotions or special alerts about events, emergency occasions, etc. Majority of our clients use the auto SMS responder or auto replies for their campaigns, which is included in all ProTexting plans. Let’s say you pick the keyword: HAPPYHOUR - a bar/nightclub owner might invite their customers to text HAPPYHOUR to 82257 to receive a coupon with special offer. When they do, the venue will collect their phone numbers, and subscribers will immediately receive their auto reply messages – example: "Thanks for joining our mobile club! Show this to your server and get 2 for 1 drinks all night. Reply STOP to end.” From that point on, the bar owner has the mobile numbers of the people who texted in. Later, with their permission, they can send a mass text message to all subscribers to invite them to a special event, happy hour promo, or anything that will boost their business. Another example, let’s choose keyword: MYTSHIRTS – This keyword is perfect for a store that sells T-Shirts. They can have posters in the store that tell customers to text MYTSHIRTS to 82257 if they would like to receive special offers, exclusively sent to people who text in. When they do, they will get a message, something like this, "Welcome to our T Shirt VIP program. Promos and specials from My T Shirts will soon be coming your way! Reply STOP to end." ... and other way you can show to potential clients your KEYWORD and SHORT CODE to text in. Ready to start building leads and new customers utilizing an auto SMS repsonder?